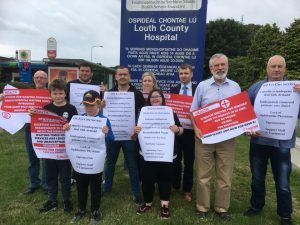 Louth Sinn Féin TD Gerry Adams has said that the increasing number of presentations to the minor injuries unit at Louth County Hospital demonstrates a growing demand for the services offered there. “A response to my parliamentary question indicates that for the first 6 months of 2018 attendances have been growing each month. “In June 2018 1,000 people attended and received treatment at this unit. “The existence of the minor injuries unit at the Louth Hospital removes patients from the emergency department at Our Lady of Lourdes. This benefits patients who have less travel and waiting time and reduces pressure on the emergency department. “The response from the RCSI Hospital group also indicates that the minor injuries unit will begin seeing patients over 5 years old from this month, and that an advanced nurse practitioner will be joining the staff. “This is a campaign which myself and Councillor Anne Campbell have been working on for over a year. “I am pleased that children between the ages of 5 and 14 will be able to access treatment for minor injuries in Dundalk. 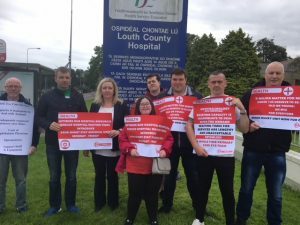 Sinn Féin Councillor Anne Campbell and members of Watters Brothers Cumann once again held their monthly protest at the gates of the Louth Hospital on Friday. Louth Hospital currently has eight surgical beds which do routine procedures from 9am-4pm Monday-Friday. 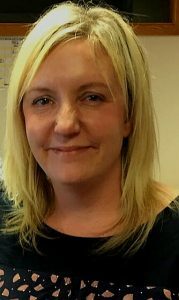 The long-promised reduction in the age of patients cared for at the Minor Injuries Unit (MIU) at the Louth County Hospital has been delayed yet again, according to Councillor Anne Campbell. The news came after Cllr. Campbell asked a question about the facility at the Regional Health Forum meeting in Kells on Monday. She said: “Sinn Féin TD Gerry Adams, along with Cllr. Tomás Sharkey, and I have been consistently asking when the MIU will drop the age limit after it was announced by Health Minister Simon Harris as far back as February last year. “In November, when the Fine Gael leadership was in Louth, it was announced with a great fanfare that this would happen in the first quarter of 2018 but when that deadline passed, both Gerry Adams and I continued to ask when it would happen. 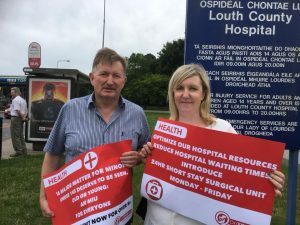 “We were subsequently told in March that the plan was to have the reduction in place by the end of June, but following my question to the RSCI Hospital Group, who run the Louth County, it has been revealed that it could be as late as September this year. “This is a dreadful state of affairs for parents in the area, like myself, who have children under the current 14 years limit. 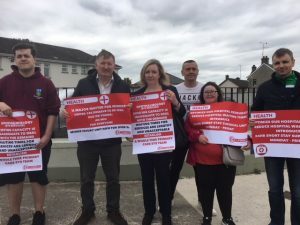 Dozens and dozens are faced with travelling to Drogheda again this summer, despite the promises from Minister Harris and the Fine Gael party. Apart from anything else, lowering the age limit would alleviate the pressure on Drogheda hospital which is already overloaded and at breaking point. Sinn Fein TD for Louth Gerry Adams has said that he is gravely concerned following confirmation from the HSE that commitments to expand the service provided by the Minor Injuries Unit at Louth County Hospital Dundalk are now in jeopardy. “Simon Harris came to Dundalk in November 2017 and announced that by February 2018 the Minor Injuries Unit at the Louth Hospital would begin seeing additional paediatric patients by reducing the current age threshold of 14 years old to 5 years old. “From these responses it is clear to me that there is a real threat that this expanded service for those over 5 years old may never become operational. “I am shocked that the Minister for Health would make such a grand announcement without any of the necessary ground work being complete. “I have asked the Minister for Health what recruitment campaign has been undertaken to ensure that the staff are in place to operate this service and I urge him to honour the commitments he has made to Dundalk.